What is the difference between the Subscriber Authentication Point and an EDPS Account? Subscriber Authentication Point is the entry point to access the journal for subscribers using a login and password. Please note that subscriptions through institutions use IP recognition. EDPS Account is free of charge. To know your IP address, click here. How to sign up for a journal email alert? The TOC (Table of Contents) email alerts service allows you to receive by email the table of contents with direct links to the articles. This service is free of charge for registered users. Once logged in to your EDPS Account, you can set up your TOC email alert in the "TOC email alerts" section. How to purchase an article? 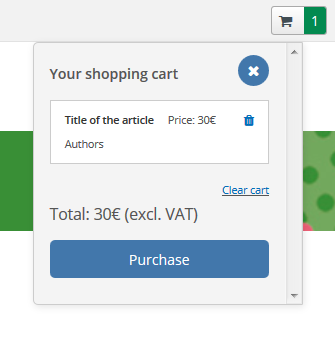 On the article abstract page, click on the "Add to cart" button (top right). Your shopping cart is now updated. You can add other articles or you can review your items in your shopping cart before purchase. You will be prompted to create your free EDPS Account, or to log into your account if you already have one. Once logged into your account, follow the instructions to proceed to the payment. Once you have paid for the article(s), you will receive a confirmation email within a few minutes. If you do not receive this email please also check your spam folder. You will find the purchased article from you EDPS account in the "Pay per View" tab then click on "Purchased articles". Please note that your article(s) must be downloaded within 48 hours. Where is the EDP Sciences price list? You will find the EDP Sciences price list here. Where is the EDP Sciences journal list? The EDP Science journal list is available here. Where is the full collection journal list? The EDP Sciences full collection journal list is available here. Where are the journal dispatch dates? You will find the dispatch dates for print versions here. or refer to the Acrobat Reader Support. How to contact EDP Sciences ? You can contact us using this dedicated form.